Antennas can get knocked going through doorways, and occasionally they break right off and have to be replaced. There's also a risk that an antenna will appear in the frame of another live camera and spoil the image. This probably happens ninety nine percent of the time during a live broadcast event - an antenna suddenly appears in the centre of the frame of a live camera, but it's not what the viewer is supposed to see. A similar issue happens in studios where stage lighting is being used - an antenna on the camera can cast an obvious shadow on the picture, and this usually occurs at least once during a typical live show. This shouldn't happen in a show with high production values and millions of viewers watching. The concept of the integrated antenna was a spin-off from the Ref-Cam which BSI introduced much earlier for Rugby matches. The Ref-Cam is a tiny body worn camera which the referee wears so that viewers can see his close-up view of the game. It is particularly useful to show the critical decisions that decide the outcome of a game. The camera is only small, but we found that with the antenna protruding, it could sometimes be dangerous during the unpredictable action of a rugby match. This led us to experiment with low profile, internal antennas for the Ref-cam. We adjusted the receivers to operate with the new antennas, and when we tested the prototype we were blown away by how well it worked. After this, it was a natural step to convert the REAL FREEDOM camera system to an internal antenna as well. The latest version of the transmitter supports 1080p50 3G video format and provides fully integrated camera control, so it uses a microwave antenna and a UHF antenna, which are both integrated inside the camera-back unit. This change to the design transforms the potential of the wireless camera. If it is on a Steadicam, it can be used in "low-mode", where it is actually upside down. This could never be done with an external antenna, as it would hit the ground. 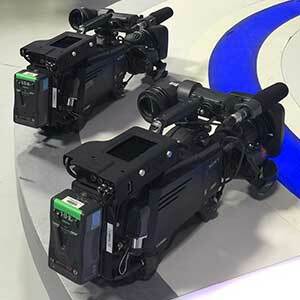 Taking the external antennas away also means that the camera operators can use the system under the arm as well as on the shoulder, and now they can rotate the camera to get the special turning shots which are often used in musical performances. Just as mobile phones have evolved away from the old external antennas to become the attractive, streamlined devices they are today, we have refined the design of REAL FREEDOM radio camera system to be sleeker and easier to use. The new design is altogether more practical and more robust, as the integrated antennas can't catch on obstructions or brush against the operator's body and clothing. The appearance and the ergonomic aspects of the system are far better, and for a camera operator it feels much more like working with a conventional cabled camera.